The iMeet® Central team is working on some exciting new enhancements to Workflow Rules. Previously, rules could only be triggered by changes to a workspace or its properties. 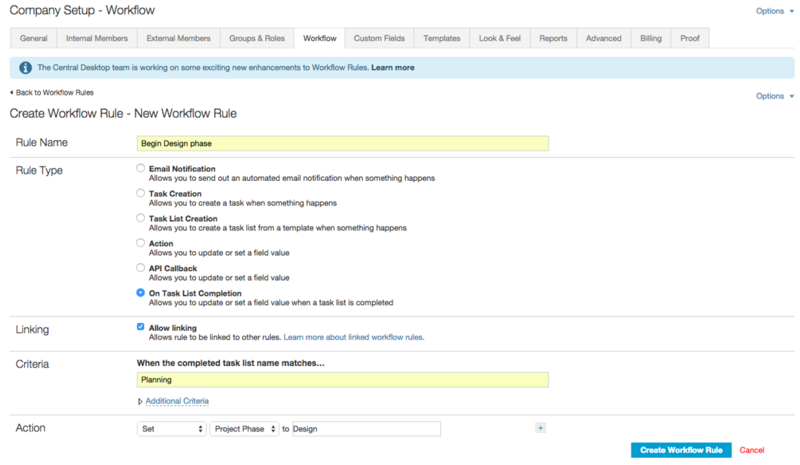 Now, rules can be triggered by the completion of a task list. This opens the door to powerful new ways of automating your business processes within iMeet Central. 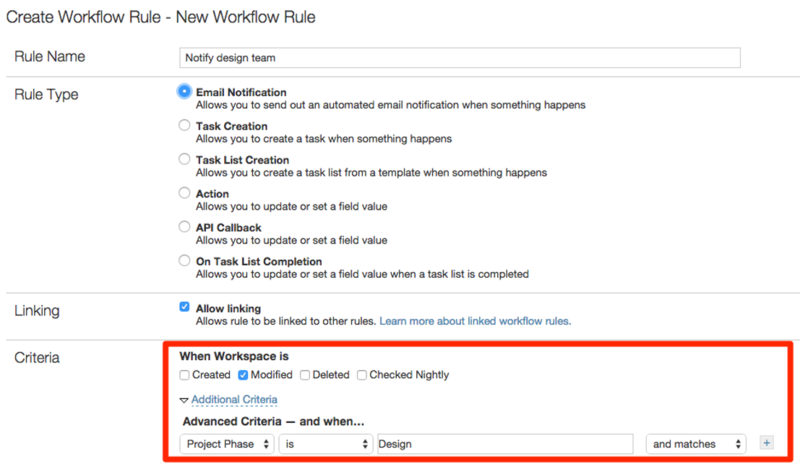 Workflow rules can now trigger one another! We call these linked rules. Completing a Task List will trigger the ability to change a workspace property. This custom workspace property is what actually allows rules to be linked to one another. To accomplish this, add additional workflow rules that listen to that workspace property and trigger additional actions. For example, you can create a rule that generates a task or sends an email notification whenever that workspace property changes to match a certain value. 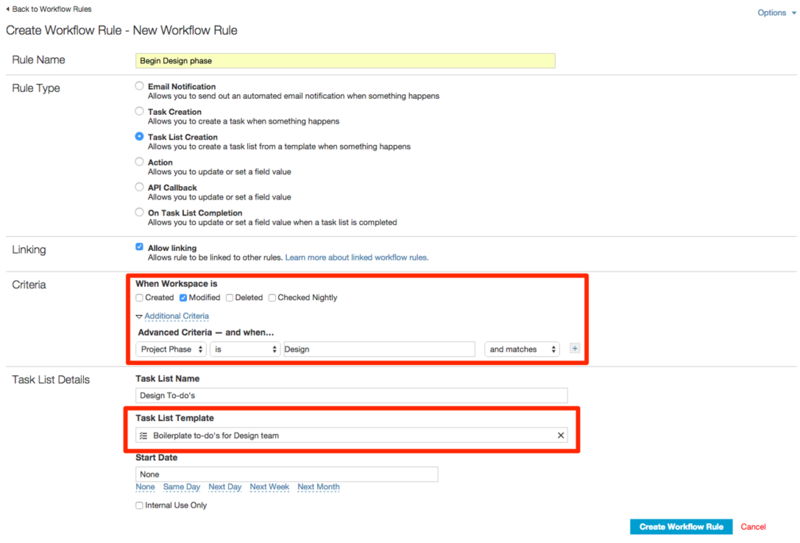 Finally, changing a workspace property can also trigger changes to other workspace properties. The system makes it possible to create complex sets of linked rules that can go down several different paths depending on what happens. Because of this, you must specify the order in which your rules will execute. Caution: Make sure that the appropriate criteria will be satisfied for each rule as it executes! If you have not ordered all linked workflow rules correctly, it is possible that your rules will produce unintended side effects. If you do not intend to link a workflow rule to another one, we recommend unchecking the Allow linking checkbox (which can be found when editing the individual rules) to prevent any unforeseen side effects. When all tasks in the "Planning" task list are complete, change the "Project Phase" (a custom workspace property made up for this example) to "Design". When the "Project Phase" is "Design", send a notification to the design team and create a task list called "Design To-do's" with several tasks belonging to it. 1. Name: Enter a name for the rule. Let’s call this example rule "Begin Design Phase". 2. Type: Select On Task List Completion. 3. Criteria: Select when the rule should be triggered and add criteria. You must type in the task list name precisely. The name of our task list is "Planning", so we will type "Planning" into the text box. You can also add Advanced Criteria for additional control, but we will not need to do that for this example. 4. Action: Here, you can select which custom workspace properties you would like to modify, and how you would like to modify them. For our example, we are going to set "Project Phase" (a custom workspace property) to "Design". That’s it! We have the beginnings of a powerful automated system set up. As you may have already figured out, you can use this combination of On Task List Completion rules and Task List Creation rules to link together rules virtually indefinitely. Best of luck building out your workflow! We look forward to seeing the innovative solutions you come up with.